4.5 24 Be the first to write a review! Don&apos;t scoop the poop! 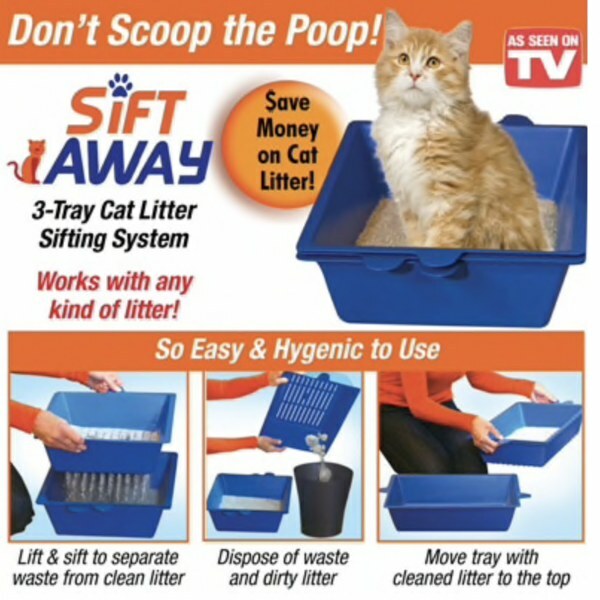 Sift Away is the specially designed, 3-tray cat litter sifting system that&apos;s easy and hygenic to use. The top tray catches the clumps - simply lift and sift, then dispose of the waste and dirty litter. The bottom two layers catch the clean litter to reuse it again and again so you can save money on costly cat litter. The set of 3 trays are identical, but when turned 180 degrees they interlock to trap clean litter only. All you do is move the clean litter tray to the top. Works with any type of litter. Plastic. 19"L x 12 1/2"W x 4"H.